Laryngeal cancer is after all a kind of cancer. It is improper to confirm a laryngeal cancer only basing on the symptoms. In fact, examinations are very important in laryngeal cancer diagnosis. Maintaining some knowledge of laryngeal cancer examination is very helpful in correctly diagnosing laryngeal cancer. Here, let’s learn something about the laryngeal cancer diagnosis together. 1. 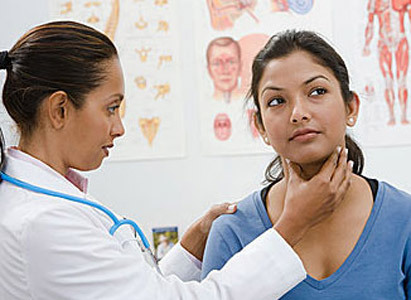 Neck examination: neck examination is one of the laryngeal cancer diagnosis methods. It includes inspection and palpation to the outline of the larynx and the lymph nodes of the neck. Palpation to the lymph nodes of the neck should starts from submandibular region and go down successively to hypohyal, cricothyroid membrane, anterior region of air tube, suprasternal fossa and the anterior and posterior borders of bilateral sternocleidomastoid to figure out the location and size of the swelling lymph nodes, so as to confirm whether there is laryngeal cancer. 2. Laryngoscopy: Indirect laryngoscopy is the most common and simplest examination for laryngeal cancer. However, if one is not satisfied with the result of indirect laryngoscopy or when it is difficult to get the pathology sample, direct laryngoscopy and fibrolaryngoscope can be performed to further study how the inner larynx is invaded by the laryngeal cancer, meanwhile, extract tissues of suspected lesion for pathological examination timely. (1) X-ray examination: X-ray lateral projection of the larynx and laminogram of larynx normotopia can clearly reveal the location, size and shape of the laryngeal cancer lesion and the change of the anterior cervical vertebra soft tissues. When necessary, laryngeal radiography can be performed. (2) CT, MRI examination: CT and MRI are helpful in determining the coverage of laryngeal cancer and its infiltration to areas outside larynx, as well as metastasis to the lymph nodes of the neck. It is especially helpful for advanced laryngeal cancer patients. (3) Ultrasound tomoscan: it is used to determine the existence and location of the swollen lymph nodes of the neck and its relation with nearby tissues. Moreover, it is also a follow-up examination method after postoperative radiotherapy. Ultrasound tomoscan is harmless, convenient, precise, low outlay and repeatable.